3D printing titanium is expensive. If you have your heart set on a custom frame, but a Métier Vélo is out of your range, or you just don't think I am the builder for you, don't let that keep you from considering a custom frame. Get in touch, let me know what you're looking for, and I may be able to recommend someone who will meet your needs. To help decide if I am the right builder for you, learn about the features that make Métier Vélo frames unique, look over suggested configurations, learn about the Métier Vélo process and prices, check out the Métier Vélo Blog, & sign up for news and production information. The cost of a Métier Vélo frame is mainly the titanium lugs. A complete bicycle depends on your choice of fork, components and accessories. A Métier Vélo bicycle with high-end wheels and components is in the same price range as a high-end manufactured bicycle from Cannondale or Trek. Consider some of the examples below. For more information, visit the Order page, or check out some reasons why you might consider a Métier Vélo frame. 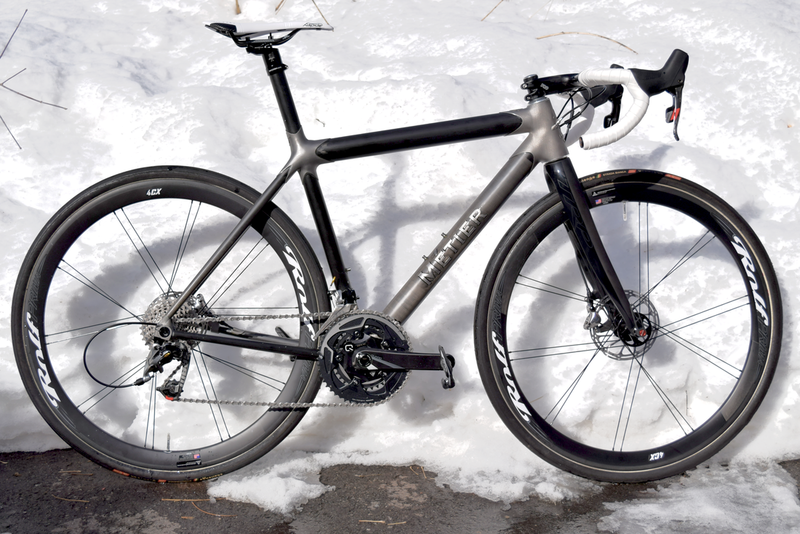 Métier Vélo titanium-carbon frame with Chris King PressFit30 bottom bracket, integrated headset,and your choice of a TRP, Enve, or Ritchey carbon fork. QR or thru-axle, several dropout styles available. Let me know what you want and I will make it. Don't know exactly? Let me know how you ride and I will advise you. Ready-to-race disc-brake thru-axle Métier Vélo frame, fork, and components. Example price includes a TRP, Enve, or Ritchey fork and a full carbon cockpit. ​The exact price depends on your choice of fork, components, wheels, and accessories. Applicable sales tax and shipping additional. Contact me for a quote. Ready-to-race disc-brake thru-axle Métier Vélo frame, fork, and components. Example price includes a TRP, Enve, or Ritchey fork and an aluminum cockpit. ​The exact price depends on your choice of fork, components, wheels, and accessories. Applicable sales tax and shipping additional. Contact me for a quote. Ready-to-race rim-brake QR-axle Métier Vélo frame, fork, and components. Example price includes an Enve or Ritchey fork and a full carbon cockpit. ​The exact price depends on your choice of fork, components, wheels, and accessories. Applicable sales tax and shipping additional. Contact me for a quote. Emma is a professional mountain bike racer and the 2016 Fat Bike National Champion. She needed a road bike. She is very patient. Finally! Emma’s Do-It-All Road Bike features 2x11 compact, wide-range 50/34 11-32 drivetrain, hydro disc brakes, thru-axles front & rear, a custom Syntace X-12 compatible rear dropout system with a hangar optimized for road derailleurs, and clearance for 33mm tubular tires. Emma's do-it-all road bike ready for its first ride.